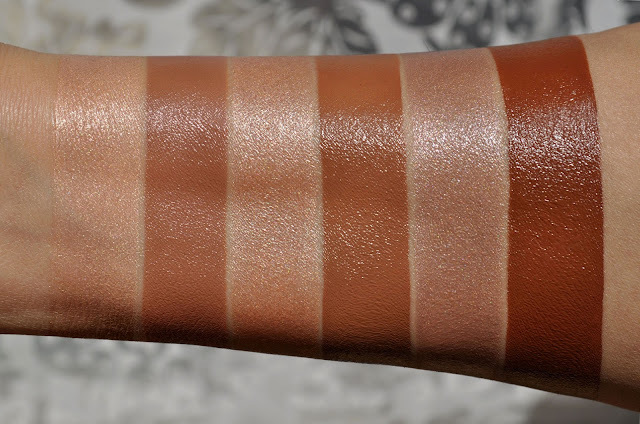 It's a shame the Dior Diorblush Light & Contour Sculpting Stick Duos, from the Fall 2016 Skyline Collection, are limited edition, because this dry-skinned girl is very fond of them. I bought all three duos, and I really love how lightweight and portable these chubby, dual-ended, contouring and highlighting sticks are. I'm really impressed with how pigmented this product is, especially the contour end. The texture of each is exceptionally creamy, and glides on the skin without a hitch. whether using my fingers, a brush, or even sponge, both products are very easy to blend, and meld into the skin. 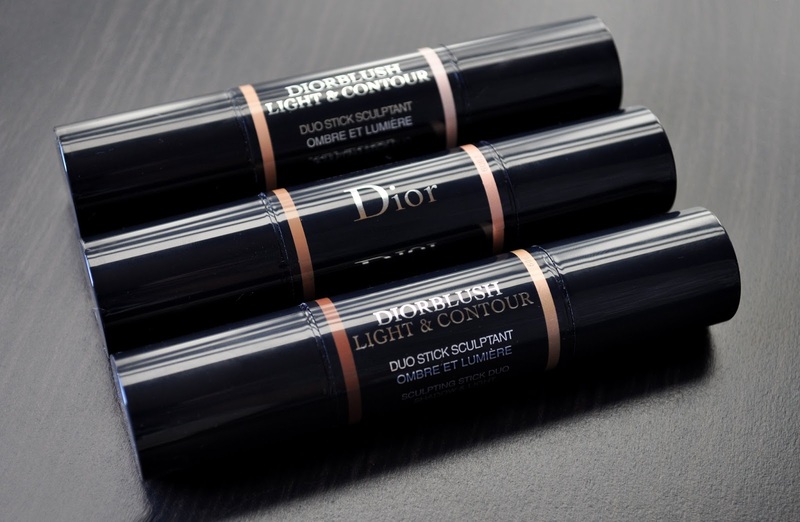 The contour shade blends down to what Dior says is a "matte finish." However, I'm more inclined to call it a semi-matte because it has beautiful, understated sheen. The highlight shade gives a shimmery radiance to the skin, and can blended out, or built up, to your personal level of glowy satisfaction. From left to right: 001, 002, 003. 001 Soft Contour: a light tan and champagne. Both shades have rosy undertones. 002 Medium Contour: a deep camel with subtle yellow undertones, and a peachy-pink champagne. 003 Intense Contour: a deep cognac and a cool, brownish-champagne with a swirl of yellow, pink and mauve undertones. This shade is really gorgeous and possibly my favorite of the highlighters. The Diorblush Light & Contour Sculpting Stick Duos are meant to be used along all the areas where you would sculpt and highlight the face. But, I also like using both ends on the lids as a shadow or an eyeshadow base, and for those of you brown blush lovers, using the contour shade as a blush. Actually, I was wearing the darker shade of 002 as my blush yesterday, and was complimented, and asked what I was wearing on my cheeks from all the SA's at every counter I visited (which was all ;P). 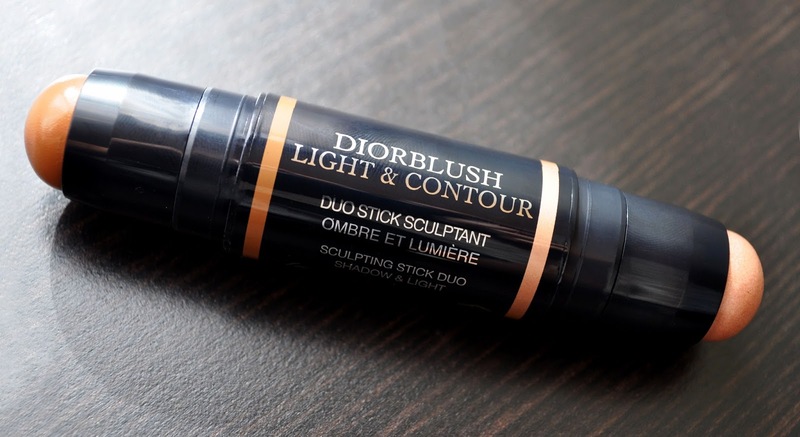 What are your thoughts on the Diorblush Light & Contour Sculpting Stick Duos? Would love to see how the contours look on you when worn as blush! October, November, and December are always mad busy for me. I'm trying to catch up on posts. But I promise, looks are coming dear. Oh, they would make excellent gifts for makeup artist. The less you have to lug with you, the better! Yay, will be lovely to see! Everything looks beautiful on you anyway but still I can't picture the contour-as-blush. No hurry - hope you are having a wonderful holiday season! I blew my budget already on Black Friday sales so sadly I don't think I'll be able to gift these, but that is a great point about portability. Too kind, too kind ;) Apart from the shop displays and illuminations, I don't get much of a sense of the holiday season. That's okay, because I feel it within and through my credit card. Oooh, what did you get? I did take advantage and got two of the Clarisonic Radiance duo sets from Sephora. Now Cyber Monday is rolling out, and I'm contemplating if I need, who are we kidding, want anything. I got some Jack Black and Art of Shaving sets from Ulta, and many of the $10 perfume sets from Sephora. I also got the creamy glows and a few lip glosses from the Kevyn Aucoin event on Hautelook. I'll see what's available for Cyber Monday, even though I'm kind of shopped out! Still hoping for a discount on Chanel products though. Can't say I've ever seen any promos for Chanel. If you ever find one, please let me know! Yeah, there weren't any. Macys did do a Macys money promotion giving $10 in Macys money for any $50 purchase - that was the closest thing I could find. Hope they do it again.